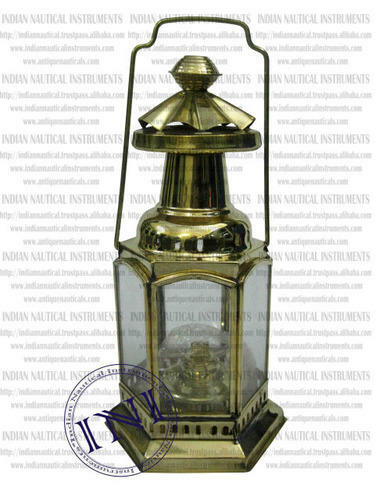 Leveraging on our industrious workforce, we deal in the manufacturing and exporting of Brass Lanterns such as Camping Lantern, Moroccan Lanterns, Floating Lanterns, Hurricane Lantern, Paper Lanterns. These lanterns are truly versatile and are manufactured at par with the industry standards. You would be amazed to see its bright light and its excellent performance. Our company holds expertise in the field of manufacture and export of Morroccan Lanterns. These lanterns are finished immaculately and are based on modern techniques and customer friendly settings. What distinguishes these lanterns from other lanterns is its vibrant light and long life. These Moroccan lanterns are highly demanded by our clients and are stringently quality tested in order to ensure that our clients get the best possible product at most reasonable prices. Our company has received immense accolades in the field of manufacturing and exporting of Floating Lanterns. Uniquely formulated, these make use of the batteries in order to deliver an efficient performance and glorious illumination. These lanterns have best quality and are portable. Besides, these are developed and designed by the leading industry experts who have gained years of experience in this domain. We have mastered the art of manufacture and export of Hurricane Lantern. These lanterns are effective and give topnotch performance. These are fabricated from supreme quality of material which is sourced from our most trusted vendors. Further, these lanterns utilize the power of excellent batteries in order to deliver an outstanding performance. These hurricane batteries could be availed in number of specifications. Counted among the topmost companies, we deal in the manufacturing and exporting of Camping Lantern. These lanterns are available in wide spectrum of ranges and are used at homes and villages in case of absence of electricity. These are eco friendly in nature since these do not require the electricity. Further, these give bright light which could easily cover large distances. Last but not the least, these camping lanterns have cost effective prices. Counted among the topnotch companies in the industry, we deal in the manufacturing and exporting of Paper Lanterns. These lanterns are perfect for decoration and are known for its marvelous quality and eye-catching patterns. Powered by the battery, these boast of effective performance and longer shelf life. In addition to this, these are quality checked under the strict surveillance of the experts before being dispatched for sale.